In 1974 Thierry Mugler set up his own fashion label ï¿½Thierry Muglerï¿½ for menï¿½s and womenï¿½s ready-to-wear. 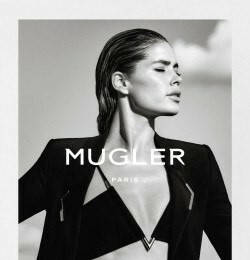 Mugler went on from this point to create a very identifiable style. He designed a new feminine silhouette where shapes and cures are accentuated by the strictness of the cut. For men, Mugler produced a very clear-cut, precise and structured image with a shouldered, slender cut for a classic silhouette. 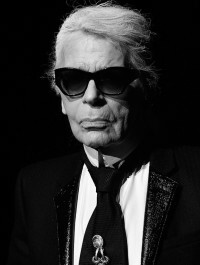 In 1978 he opened his first boutique in Paris at 10, Place des Victoires, 75002 Paris, France. In 1983 and 1986 he opened his first exclusive boutiques abroad in Brussels and Geneva. 1984 Thierry Mugler celebrate his 10th anniversary of the creation of the house. So the Autum/Winter 1984-85 collection was presented in a mega-show before 6,000 people at the Zenith in Paris. It was the first fashion show in France ever opened to the general public. In 1987 Thierry Mugler opened a second Paris boutique at 49, Avenue Montaigne, 75008, Paris, France. This shop later became the first key boutique in the Thierry Mugler universe. 1992 he launched his first fragrance for women: ï¿½Angelsï¿½. The bottle symbolizes the designerï¿½s imagination, as it is based on a timeless and universal symbol: the star. An original and innovative fragrance which forged a new direction in the world of fragrances; the ï¿½goumandï¿½-rientals. Thierry Mugler presented his first haute couture collection at the Hotel Ritz in July, 1992. In 1995 an 1996 was a acceleration of exclusive boutique openings worldwide and a third Parisian boutique at 45, Rue du Bac, 75007, Paris, Farnce. This is the first shop to congregate all lines and accessories designed by Thierry Mugler under the same roof. In 1997 he launched his first menï¿½s fragrance, ï¿½A*Menï¿½. The French couture Syndicate officially invites Thierry Mugler to present a couture collection during the haute couture collections calendar. In addition, Thierry Mugler was invited to sit on the Comite Colbert; thereby joining the top 75 French companies that share the passion for excellence, creativity, and luxury in the production of their merchandise. His style is instantly recognizable: structured elegance, accentuated shoulders. 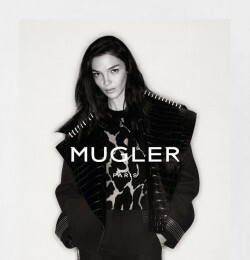 Mugler went on from this point to create a very identifiable style. He designed a new feminine silhouette where shapes and curves are accentuated by the strictness of the cut. "The prophet of Futurism", as he has been referred to, Thierry Mugler is an instinctive designer who never looks for inspiration. According to Thierry Mugler, "intellect is the servant of the spirit." He strongly feels that his clothing is modernistic and not futuristic. Clothes of today should have nothing to do with the past. They should create elegance with simple form and structure and add defined shape to the body, volume, form and simplicity. When one has found a method of self-expression, one evolves with it. His clothing attracts a woman of strength and ï¿½lan. Mugler usually designs 2-piece outfits with a jacket feature, full sleeves, masculine cuts, emphasizing the waist and hips to create a perfect body. He often uses solid colours as a sculptor would. 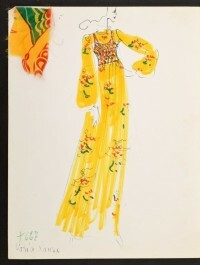 He often uses pointed angles on collars, hems, sleeves, waist and hips. He does use a lot of prints but at times uses patches of leather. He uses less of accessories and headgear. He tries to create drama into his clothing but usually the devil features, example gelled hair in the shape of horns. Mugler also designs clothes for men but often uses bright colours for them like orange, yellow, etc. which is unusual for men's clothing. Fabrics: Jersey, vinyl, Lycra, Gingham and Leather are his favourites.